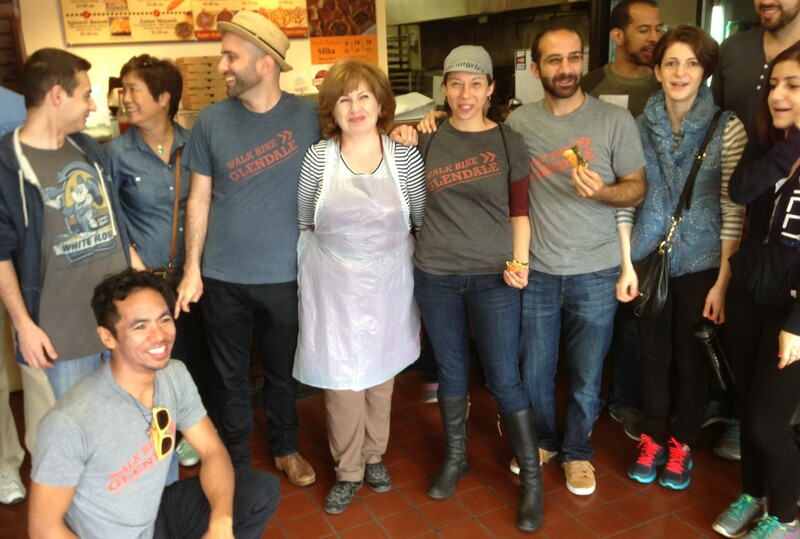 Last Saturday, Walk Bike Glendale hosted its second Pastry Walk event. Walk Bike Glendale advocates for a safe places to walk and bike in the city of Glendale. They host events and workshops, and press the city for new facilities, including Glendale’s Glendale Narrows Riverwalk park and its new planned bridges, and future bike lanes being studied for Chevy Chase Drive. Walk Bike Glendale recently became a local chapter of the L.A. County Bicycle Coalition. Glendale is the third most populous city in Los Angeles County. The city has a genuine popular walkable downtown, but is more characterized by its car-centric suburbs. With elected leadership and a County Public Health PLACE grant, the city made some good strides toward encouraging walking and bicycling, but Glendale hasn’t quite embraced livability enough to be considered among of L.A. County’s livability leaders. The city of Glendale is home to one of the largest Armenian populations in the United States; roughly 40% of Glendale’s population is Armenian. 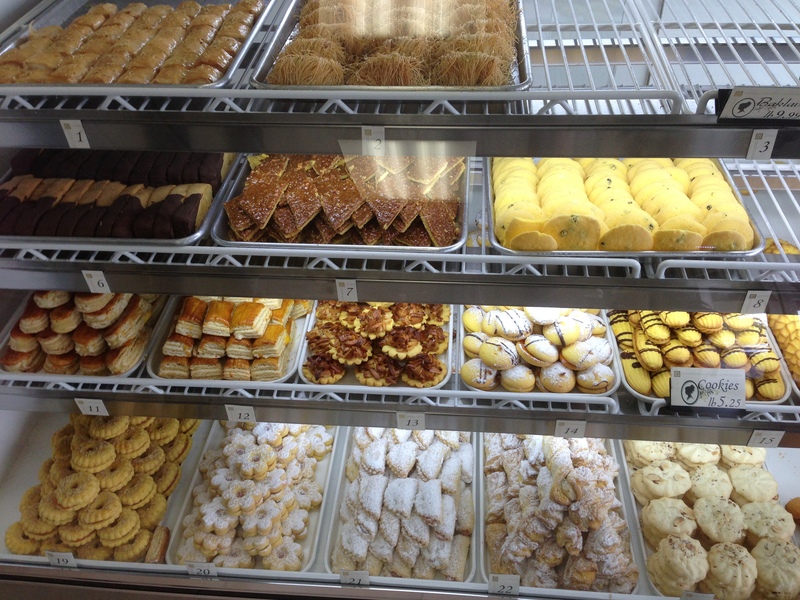 This means Glendale is also home to a significant density of great Armenian bakeries. Walk Bike Glendale’s Pastry Walk only covered two city blocks, Glendale’s East Broadway from Chevy Chase Drive to Belmont Street, but visited four different bakeries there. I found them all to be excellent. The atmosphere wasn’t much (think it is as the Armenian equivalent of Burger King), but Lahmajun featured delicious hot-out-of-oven savory treats. The triangular spinach beorek was filled with spinach, but not just spinach – spiced, tangy delicious spinach filling. Also good was the string cheese-filled beorek. Gata sweet bread from Cafe du Jour. SBLA didn’t find any coins in our slice. 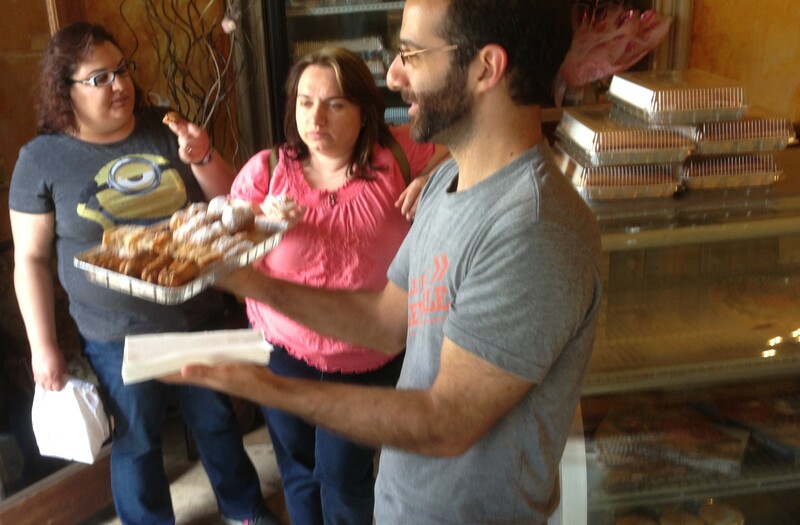 The name may be French, but this boutique bakery’s delicious specialties are Armenian sweets. 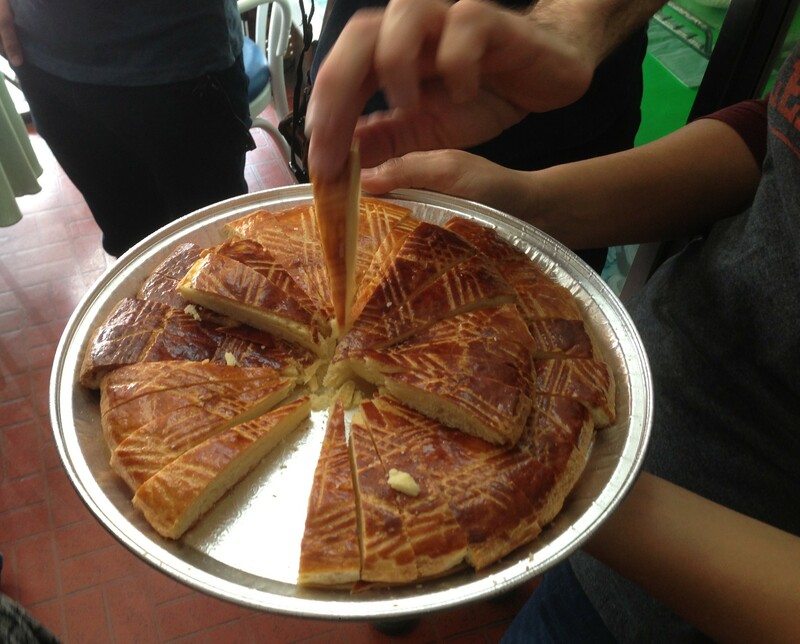 Cafe de Jour’s visit featured samples of gata – a round sweet flat bread, with a hint of a custard flavor. The shop owner told us about a special Armenian gata tradition that takes place on the Miginink holiday, midway between Lent and Easter. Gata loaves are baked with a coin (here, typically, a dime or penny) inside. The family member who finds the coin in her or his piece of gata will have a lucky year ahead. By this point, even with walking in between the establishments, I was already feeling somewhat sated. Van Bakery also felt fairly fancy. Their offerings include plenty of sweet and savory. The most delicious item I sampled there was a sort of layered filo dough cream puff. Also tasty was their crisp sugar cookies. They have plenty more, sweet and savory, and do catering. 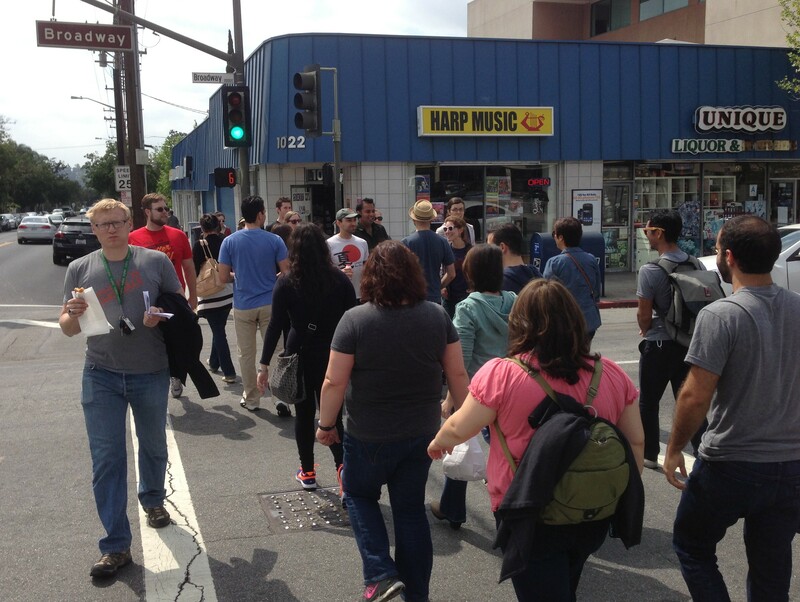 Kudos to Walk Bike Glendale for bringing foot traffic to these great local businesses.